This past Monday, as part of our first week of the Knight-Mozilla Ideas Challenge learning lab, we listened to Aza Raskin talk about How to Prototype and Influence People. 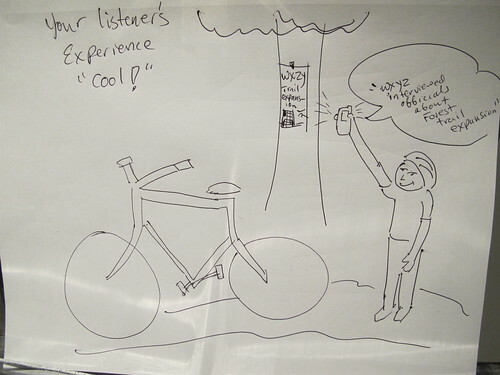 ask potential users of the Public Radio Roadtrip... "Well... Is this how you see the experience of creating 'roadtrips'? Is this what you want to do with your stories?" The next step after that is to iterate fast and adjust the app. To iterate the solution as well as the understanding of the problem. (See slide 34). One of the things about digital culture is that it thrives on metaphors (surf the web, put your computer to sleep, bookmark a page), and so it actually took me a while to realize that what you are talking about are *actual* roadtrips, not metaphorical ones. It's a little bit cheezy, but have you thought about a tagline or an explanation in two or three bulletpoints? Also, I think that, similarly to Google Street View tourism (in which you visit a place with Street View while sitting behind your computer drinking beer), people may want to get a little taste of that roadtrip experience from back home. Maybe something that entices them to actually try it out in real life? Have you thought about ways in which you can make that type of experience more visual and fun? Anyhow, very curious to see how this moves forward, cheers! 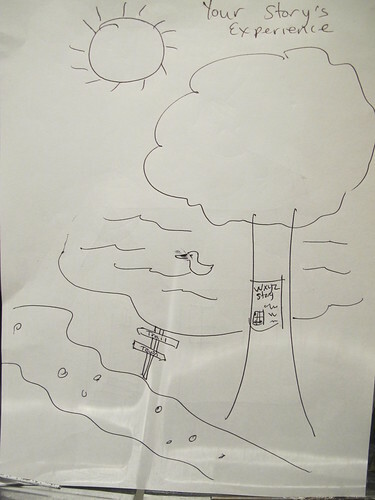 I might have more people walking in the park (to discover the story serendipitously) in the drawing "Your Story's Experience" I might also post additional stories on trees in area as well. Stijin, Thank you for your comment. Your observation about the metaphor of the roadtrip experience being something that starts at the computer and ideally extends out into the real world was very helpful to me. It made me rethink the way I was presenting the experience, and prompted a follow-up blog post. My hope is that this app bridges the online and real-world experiences. I currently have as a tagline "Map, Share and Publish your own stories from NPR.org as a Public Radio Roadtrip!" As you suggested, I think I'll use this as a starting point and be sure to refine this... especially in light of refining my Problem Statment and my vision of the public radio roadtrip Experience. "We found projects made greater headway [with a] tightly-defined interest group [of] repeat users." 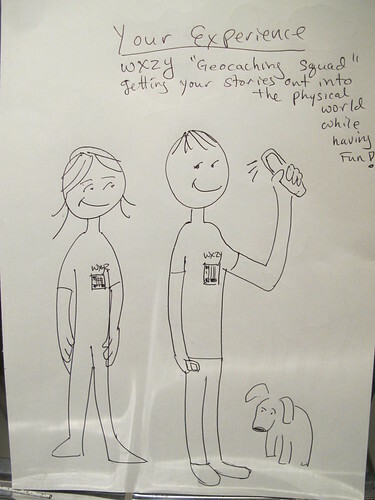 I wonder if one of the interest groups that I would work with (on the audience side) would be like a biking group or a geocaching interest group. I think they would clearly be the ones to give feedback on the roadtrip experience. Thanks again for the feedback. Look forward to seeing how this moves forward as well :) I'll contact you via P2PU and we can keep up on each other's projects.